Facing A Worsening Housing Crisis, Chico, Calif. Tries Tiny Homes For Homeless California's deadliest wildfire worsened an already bad housing crisis in rural Butte County. But the fire has jump-started a local effort to build a tiny home community for area homeless. 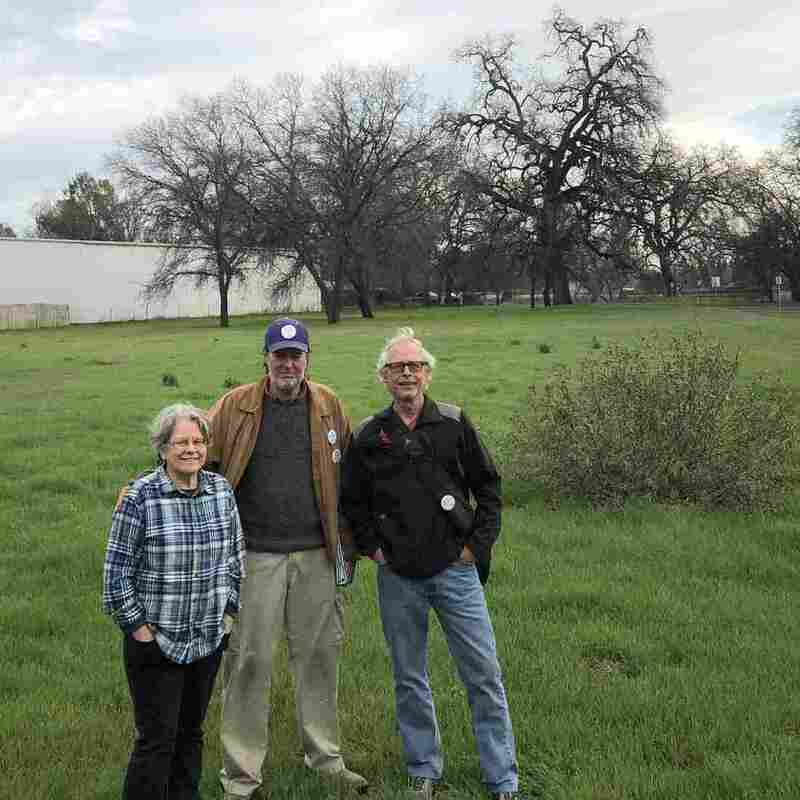 Chico Housing Action Team organizers Leslie Johnson, left, Charles Withuhn, center, and Bill Kurnizki, right, in the field in south Chico where they plan to soon break ground on a 33-unit tiny home community for homeless adults called Simplicity Village. "The fire created a whole new reality, it added an urgency for sure," says Charles Withuhn, a volunteer and board member with the nonprofit Chico Housing Action Team or CHAT. The current city council has given the project the go-ahead. The retired contractor and small business owner is showing me around the 2.6 acre future site of what will be called Simplicity Village. The tiny home community is planned to house some of Chico's homeless — including some from the Camp Fire. It's across from a lumber yard and just off Highway 99, a local thoroughfare through Chico. "There are a lot of problems in the world that I can't fix. I can put together a little tiny house," he says. It's a citizen-led approach that's being funded almost entirely though private and corporate donations of money, materials and labor. The group estimates initial construction will cost roughly $790,000, with about half of that coming from in-kind donations. "We're a volunteer army," says CHAT organizer and board member Bill Kurnizki. "We fundraise by doing musical programs, putting letters out to people and asking for donations. So the windows, the doors, siding, roofing — all donated." The tiny home village is not solely for Camp Fire homeless. But CHAT organizers say some of the people made homeless by the blaze will get priority slots. "We want to accommodate Cape Fire victims and maybe one third of the buildings will be set aside for them," Withuhn says. People just can't afford conventional size housing. A lot of people just can't. But a little tiny house, people can afford to rent that. CHAT organizer Leslie Johnson, a local attorney, notes that many homeless often get some federal subsidies such as Social Security, Supplemental Security Income or disability benefits. Simplicity Village will charge just $200 a month for rent and utilities to cover the village's operational expenses. "We just have to look for every kind of opportunity to try to help solve this housing situation," Johnson says. "People just can't afford conventional size housing. A lot of people just can't. But a little tiny house, people can afford to rent that." The Camp Fire's historic destruction worsened an already difficult housing crisis in and around the northern city of Chico. Even before the Camp Fire, Butte County already had some 2,000 homeless according to a 2017 survey. Since the fire, local rents have skyrocketed further, homes are selling well-above asking and there are almost no vacant rental properties available. That reality has exacerbated the housing crunch as some fire refugees start to leave the area and the state altogether. There are other tiny home plans afoot in other parts of California and in other states. But CHAT hopes Simplicity Village becomes something of a model for other cities in the state grappling with widening inequality and the impacts of climate change. "This is as much about sustainability and community as it is about tiny," Withuhn says. "We may be entering the final phase of human existence and our ability to adapt and continue to live on the planet will depend on imaginative ways to live a smaller carbon footprint," he believes. "This community will have a fraction of the carbon footprint of the typical urban or suburban setting." We may be entering the final phase of human existence and our ability to adapt and continue to live on the planet will depend on imaginative ways to live a smaller carbon footprint. This community will have a fraction of the carbon footprint of the typical urban or suburban setting. CHAT presented a detailed tiny home village proposal some four years ago. But they were met with foot-dragging from the city council at the time and then outright rejection. Organizers believe it took the Camp Fire to finally help get the idea off the ground. In April they hope to break ground on 33 one-room homes. Most of them will include a small bed, kitchenette and bathroom. The village will also have five larger buildings for community meetings, meals, kitchen, laundry, as well as a workshop area and a security guard house. Exterior and interior of the tiny homes built for a community called Simplicity Village in Chico, Calif. The group is coordinating with county and state agencies to provide on-site mental health and other support services. The group will screen applicants and those accepted will have to live by a community code of conduct that includes no drug or alcohol use. CHAT has signed a letter of intent for an 18-year lease in a three-way agreement with the private landowner and the city of Chico. They've hired a civil engineer and are working with city agencies to get water, sewer and electricity permits lined up. This Chico tiny home village, organizers admit, will be just small piece of a much bigger housing puzzle here. Local media are calling for the city of Chico to do more to accommodate fire evacuees. CHAT is also calling for more mobile home parks, more affordable, subsidized apartments, more tiny home villages and other creative solutions. Organizer Withuhn says it's not about political ideology. "Politics has nothing to do with this," he says. "This is about human rights, human dignity, having a community. Are we going to be civilized and pull together as a team when there's a crisis? Or is it just: guy with the most toys at the end wins, that's it, who cares?" "We're saying we'd rather be part of a community," he says, "that's pulling together to solve a problem."